When phone manufacturers unveil their top tier devices, there’s usually two notorious groups of consumers to look out for and for a good reason. Those who are in for the real deal, usually budget is the least of their worries and those who desire to own a top end device but can’t afford to pay thousands of dollars just on a phone. The Huawei Honor View 20 could be easily regarded as a watered-down version of Huawei’s current flagship – the Mate 20 Pro. It’s certainly not in the same league but incorporates just enough goodies that’ll make some of them smile in adoration. So much has been said about Samsung’s punch-hole camera found on the galaxy s10 series, it’s genuinely attractive and feels more premium compared to iPhone’s notch – no offence, I like iPhones more. Well if you’re seriously considering this device, be aware it comes with a punch-hole camera making the bezels slimmer than most devices on the market. Since we’re done with the intro, let’s get some bit of history on the honor View 20 and the rest of good stuff, for those who’ve had the honor view 10 are reasonably familiar with the series. While the honor 10 came with an interestingly larger rear camera sensor (25megapixels) at the time, you’d be more pleased to learn that the manufacturer has moved a notch higher with a 48Megapixels sensor instead. Whether you’re looking at it as a spec upgrade to your favorite Huawei series or just looking for something closer to Huawei’s current flagship device but can only afford to churn out half the price – it’s a honestly interesting device to consider. The front panel is almost entirely covered by the display panel except for the punch-hole camera – something we’ve came to associate with Samsung’s high-end offering. The honor sub-brand is usually underestimated and mostly associated with just trying to replicate what the top tier devices can do but in a pocket friendly packaging. Understandably there are a few areas where corners had to be cut to achieve a lesser price tag. The camera sensors are huge though do not carry Leica branding as the senior sibling do and of course we get a cheaper but still OK display panel. In addition, we don’t get the same waterproofing standards you see on the mate 20 pro, neither do we get wireless charging capabilities. As we’ve already indicated earlier on, the Huawei honor view 20 is cheap, but not bottom-rock cheap as some of you might be thinking, but just cheap enough to save you some coins you’d otherwise spend on the flagship sibling. For a price tag of about Ksh. 60,000 in Kenya, it’s slightly costs less than the galaxy s10’s, iPhone XS series and even it senior sibling the mate 20 pro, but that’s still way above what a common consumer can afford. The technologies underneath are worth the price tag, but not everyone will find them amusing so it’s entirely down to you. 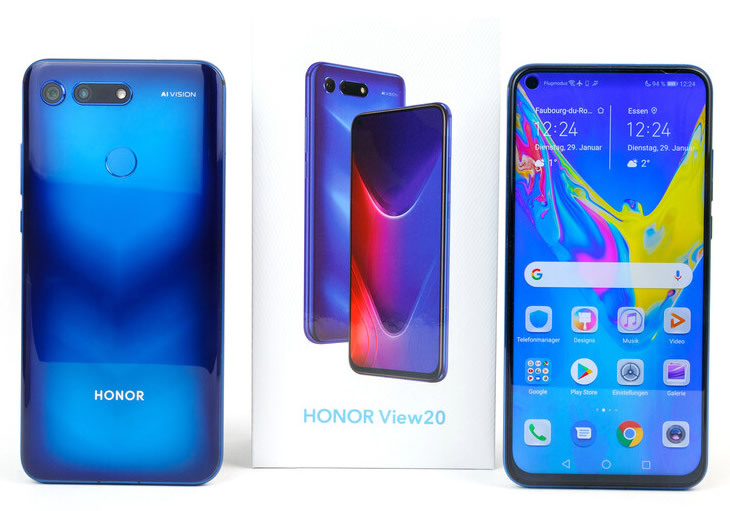 The Honor View 20 is currently available in two versions; the base model costs with 6 GB of RAM and 128 GB of internal storage, while the premium version with 8 GB RAM and 128 GB of storage. It comes in a decent back glass in Phantom Blue, Sapphire Blue and Midnight Black. For those who love taking selfies, you’ll love a thankfully larger 25megapixels sensor enclosed within the display panel through a punch-hole.